The wild hetman stood like a statue for a space, dimly grasping something of the cosmic tragedy of the fitful ephemera called mankind and the hooded shapes of darkness which prey upon it. Dedicated readers of this blog will recall a post from Steve Tompkins, who last July took umbrage at the ravings of a guy on one of the REH e-mail lists, who had opined that Howard’s on-again, off-again girlfriend Novalyne Price was responsible for his suicide, and furthermore claimed that author Joe Lansdale had said much the same thing in his introduction to Wildside’s Weird Works of REH #3 (the intro in question is available for reading online here). At the time, Steve judged the claim preposterous — and guessed that Lansdale likely had said nothing of the sort in his intro. 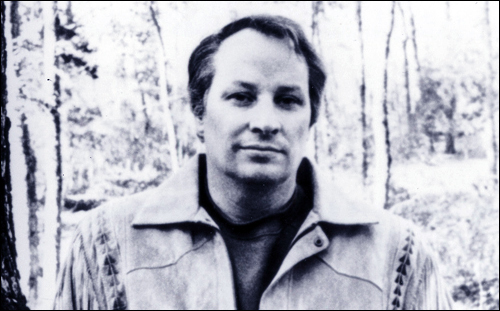 Read a piece on the site where it was suggested that I (“the western writer” which is probably no more accurate than horror writer or crime writer, and I’m better known for the latter two) said that Howard killed himself over Novalyne Price. No I didn’t. I did suggest that the loss of her — and his mother, among other things — were the final straw. But the straw was bent at birth, and to blame anyone for his choices is ridiculous. I think Howard, had he lived in modern times, might have avoided an early death by the use of something along the lines of Zoloft. But it didn’t exist then and no one really understood that kind of depression. It took certain events to send him over the lip, but they could have been any events, and my guess is it worsened as he grew older. Suicide seems to have been a part of his thinking for a long time. But Novalyne sure didn’t have anything to do with it. She didn’t owe him her life to make his life a happy one, which, in the end, it couldn’t have. Just wanted to get clear where I stood on this matter. You have to read the whole thing, not just take a line from it you like. I never bought that he killed himself over his mother, or for that matter Novalyne, just that all these factors back-to-back led him to do what he was wanting to do for sometime; it was more than he could handle, but he was the one who used the gun. I never said what “simperingflophouse” said I said, at least it’s more as if he took the line, which I did say, out of context with my intent. That may have been my fault, but it wasn’t the thesis I was after. I’ve always disliked the idea Howard did it because of his mother or his girlfriend, but think that they were the final straws that broke his depressed back that day. It could have been most anything, really. S.T. 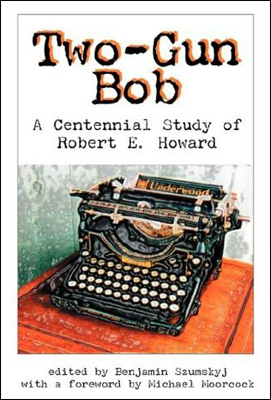 Joshi’s article “Bran Mak Morn and History” in Two-Gun Bob: A Centennial Study of Robert E. Howard comes trailing a backstory that originated with the author’s 1996 magnum opus H. P. Lovecraft: A Life. 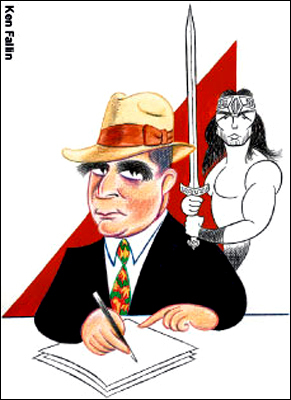 That book more than deserved its Bram Stoker and British Fantasy Awards, but phrases from the pages (502-503) on which Robert E. Howard is introduced as an untutored provincial-turned-pen pal were destined (and designed?) to live in infamy among even the least touchy Howardists: “Fanatical cadre of supporters,” “subliterary hackwork that does not even begin to approach genuine literature,” “[Howard’s] views are not of any great substance and profundity,” “Howard’s style is crude, slipshod, and unwieldy.” The artful dismissal-intensifier “does not even begin to approach” is surpassed a page later when Joshi quotes Lovecraft’s “There’s a bird whose basic mentality seems to me just about the good respectable citizen’s. . .” evaluation of REH in a December 14, 1935 letter to Kenneth Sterling and then editorializes “If Howard’s later devotees would adhere to this view, they would make themselves a little less ridiculous in proclaiming vast profundity and originality for his work.” Only a little less ridiculous, mind you — that might qualify as the unkindest cut of all, were there not many cuts yet to come. Howard’s prodigious imagination in conceiving the life and actions of primitive peoples is certainly remarkable. It was probably derived from his own fascination with what he perceived to be the freedoms of barbarian life and his implacable hostility to civilization — attitudes fostered by his being the descendant of one of the original settlers of Texas and his lifelong residence in the remote village of Cross Plains. These provocative conceptions are, however, frequently offset by a lamentable crudity of expression and a yielding to the most hackneyed conceptions of pulp fiction: characters who are broad caricatures rather than living beings; lurid bloodletting and melodrama; implausibility of action, especially with regard to supernatural phenomena; and a general slovenliness in diction and plot development. Howard and his work have attracted a small but vocal band of cheerleaders who are determined to give him high rank as a writer and thinker, but it is unlikely that he will ever have as high a standing as, say, his friend H. P. Lovecraft in general literature. Check out this morning’s Wall Street Journal for a nice article on Howard by respected political/culture writer John J. Miller. The Cimmerian gets name-checked, and John pits three words of my conservative optimism against a burst of Rusty Burke’s liberal pessimism. Fun for the whole family. John is National Political Reporter for the National Review, and does a lot of freelance writing for the WSJ and other publications. Last year he wrote a good article about Lovecraft in the same paper, which you can read here, while in 2002 the WSJ published his piece on Christian values in Tolkien’s Middle Earth. Getting Howard some good press in one of the nation’s most prestigious newspapers serves as a nice bookend to January’s coverage of him in The Washington Post by Pulitzer Prize winning critic Michael Dirda, and is a fine way to wrap up the REH centennial. Thanks, John. UPDATE: John also blurbed his article and this website at National Review‘s The Corner, one of the cooler conservative blogs out there. Check it out. UPDATE #2: Another National Review veteran, S. T. Karnick, offers his own brief exegesis of Howard’s relevance at his personal blog. Many folks noticed the huge chartered tour bus in town last week-parked in the restaurant district, downtown and out by the Robert E. Howard Museum. At each stop, a collection of travelers stepped out with digital cameras to record everything and everybody. After all, how often does a group from around the world get to visit Cross Plains and see life in the slow lane up close and personal? Some folks might have recognized Leo from Los Angeles, Rusty from D.C. and Mark from Vernon, Texas. These fellows are part of the faithful group who attend the annual Robert E. Howard Days. Patrice has visited our area before, but admitted it had been several years since he has traveled from France to Texas. Others were first time visitors from England, Canada and seven states, besides a range of cities in Texas. The group was given a special tour of the Museum by Project Pride members. 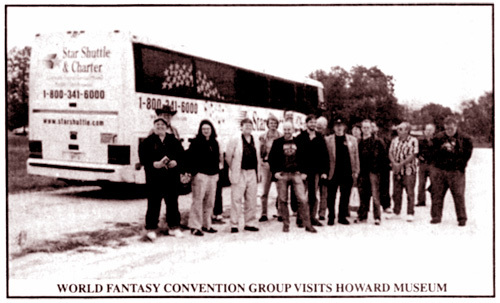 The trip had been arranged as part of the pre-convention activities of the World Fantasy Convention being held in Austin. The Fandom Association of Central Texas played host to over 700 writers, scholars, artists and aficionados of the entire genre of fantasy, science fiction and speculative fiction works from around the world. In addition to touring the Museum, the Cross Plains Public Library and the general downtown area, the group enjoyed a local lunch before returning to Austin and the remainder of the convention. [redacted] was especially impressed with the new Meet the Author display in the library as he is the next author on that agenda. He will be here in February to discuss Howard as a Texas writer, influenced by Texas history, economy and geographic environs. One of Howard’s more famous characters, Breckinridge Elkins, is pure larger than life Texan, and will be a key feature of Finn’s presentation. Several members of the traveling group were delighted to find some of their writings on the shelves of the Museum book shop and quickly autographed the copies. Project Pride was equally delighted to meet more of the authors of the publications that are for sale locally.